After 7 1/2 months of giving our daughter 4 shots a day (sometimes more if she wanted to eat more), she “went on the pump” July 22nd. This is terminology used for saying that she now wears, 24-7, a cell-phone sized device that administers insulin for both meals and a continuous base-line amount. This little device has a cartridge containing a 3-day amount of insulin (it can hold more, but with hot weather, the insulin can “go bad”, so we only put in 3 days worth). It is attached to a length of tubing which is “connected” to her mid-section via an “inset” or, as I’ve heard other parents call it, a “port”. We were told, in advance, of the transition period required to set the levels on the pump to Maddie’s needs…a period of about 6-8 weeks. We were told, in advance, of the benefits and limitations of the pump. We were told it was the best way to manage her diabetes. We were told that it would indeed add more challenges due to technological issues, inset function, etc. I was aware on a cognitive level of these things. I was not aware on a personal, day-to-day experiential level. To briefly state what the last LONG two months has taught me, it is that THE PUMP IS ONLY A COMPUTER. It only “knows” and can “do” what you have programmed it to do. And then, it can only do what it has been told, if you have given it the correct resources to pull from, ie. enough insulin in her cartridge, tubing without air bubbles in it, and an inset that is not crimped or otherwise compromised. The number of variables as to what can go WRONG with the pump is oftimes overwhelming for me. I won’t go into all the particulars of what has to be checked every day (that may be A topic for another post), but I will say, that as we have been calibrating the pump (tweaking and adjusting the ratios); I have also had to calibrate my mind–to adjust and correct what I somehow had in my head that the pump would do for Maddie. I never expected it to be able to test her blood sugar levels…I knew all along she would still have to prick those sweet little fingers multiple times a day (in fact, MORE times now on the pump). I knew all along that it would not be able to adjust itself to meet her needs. But somehow, getting it square in my head that this VERY EXPENSIVE, tiny little thing is ONLY a computer, has helped me. It is NOT a pancreas. It doesn’t know how much carb she is getting ready to eat…we still have to count the carbs for a meal or snack and TELL the pump this info. It doesn’t know when she is getting ready to exercise (exercise causes her to use up carbs pretty quickly, so you have to back off on the amount of insulin you give her). It doesn’t know that she is anxious about taking a test, or excited about a party, or angry, or ANYTHING!! all of which can raise her sugar levels! There are so many variables a healthy pancreas monitors (our bodies are truly amazing! 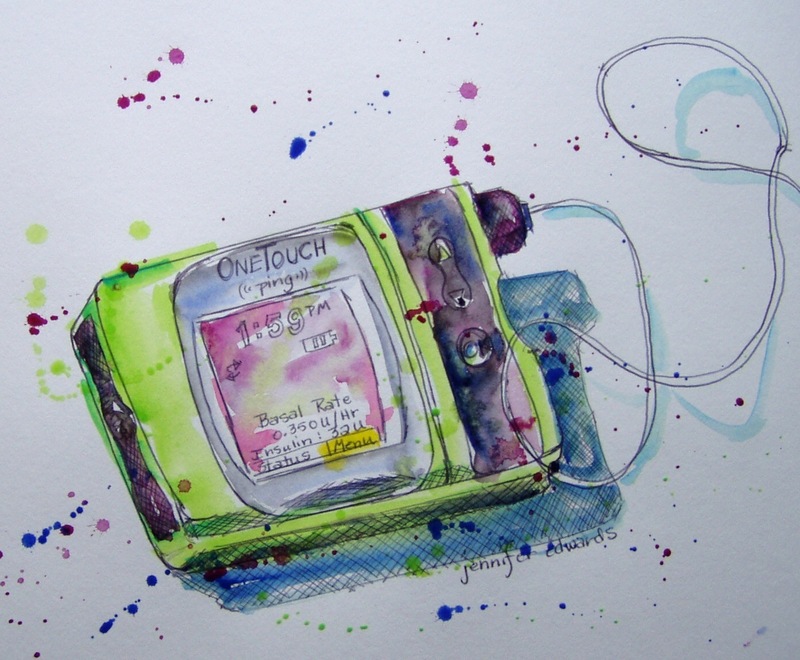 ), but this little device is no pancreas! Lest you think it is all doom & gloom, the pump DOES have many benefits that mere shot-giving cannot touch. Once all the ratios and levels are set (for the time being ONLY, since she is always growing and her insulin needs are always in flux), then it will do all the math for us. You type in the number of carbs she is getting ready to consume (and hope she will actually consume all of them!) and then type in what her current blood sugar level is, and it will calculate how much insulin she needs based on the time of day (it changes throughout the day), based on her insulin sensitivity level, and what insulin she may still have on board, if any. Very useful, very helpful information. She is also able to give herself insulin when we go out to eat, instead of us giving her a shot in public. She also doesn’t have to get the shots, although the burning of the insulin going in is felt every time, just like it was with her shots. We are even able to adjust the basal levels so that she has less of a chance of going low in the middle of the night. Yet we are still testing at midnight every night. We did, however, drop the 3 am testing several weeks ago, for which we are very thankful. Neither my husband nor I are ready to drop the midnight one…not sure we ever will. So, in many ways, my husband and I try to THINK like a pancreas. But here we see our own limitations as well. As much as we can predict, adjust levels, bolus for fewer carbs, or whatever; we are not able to keep Maddie’s blood sugars within “normal” limits at all times. We thought, or perhaps I should say, I thought, I would better be able to do this with the aid of the pump. Every day, I’m reminded that just as the pump is not a pancreas, neither am I. I am human. I can only do the best I can with the information and technology I have at my disposal. And then, I have to leave it there and pray. Jen, Thanks for sharing this issue. I am afraid that those of us who are fortunate to have reasonably good health and have children without serious illness forget all that parents must go through to help their children live the best life they can. I hope Maddie’s little “pancreas” computer will get calibrated and will help her to be healthier. I’m pleased that modern science has come far enough to give you a good, if not better way to manage your child’s condition. I know what a struggle this is for you and I am amazed at your strength and the love you have for Maddie. I know we all say “that’s what any parent would do”, but the reality is, that’s not what any parent would do. So here’s your pat on the back for doing what’s best for Maddie despite the difficulty of the situation. Thank you for sharing your story. I don’t know if you’re a praying family but your family will be in my prayers anyway. Kate, we SO appreciate your prayers!! We are also incredibly thankful for modern science and all the advances made in the field of diabetes! And thanks for the “pat on the back”…it’s nice to receive, even though we wouldn’t do anything differently even if we never got a “pat”. Jennifer, thanks for opening your heart. The way you wrote about Maddies’s sweet fingers touched my soul. I truly believe what Jesus said about sanctifying our suffering and sometimes I cling to this like a man clings to a cliff with his hands… sometimes only fingers… maybe just fingernails, even. I’ve read this post and the last. I am sorry for what you and your family are having to deal with. I can relate a bit. My son is autistic and this greatly limits our excursions/travel, etc. Most tragic would be the dream of what he could have been if only, but thinking about that is not helpful. My job is to help him get to the best that he can be. I think that over time Maddie will be so used to who she is, that it is she that will help you and your husband along. I think you all will be pleasantly surprised at who she will grow into, and what she will be able to accomplish with her life. My son Matt has been the one that has taught me – from him I have learned to become more empathetic, more patient, more accepting. You too will grow, I think. I wish you all the best. Our 8-yr old also went on the pump this summer. We love it though the tubing hanging is a real worry for me with our active little sweetheart. I am determined to modify some dress patterns (with short zippers in seams) to eliminate one more danger for our grandbaby. The vigilance required is constant, isn’t it? Thanks for sharing this with me, Susan…I understand all about the tubing worries! I’m often reminding Maddie to tuck her tubing in, so it doesn’t get caught on something. You are right about the constant vigilance! This is a wonderful device really, it’s helped so many patience in having a normal lifestyle… and it’s sad that the inventor had to go through so much before getting it approved by the FDA. Jennifer, you express so well what needs to be heard as to the difficulties of managing diabetes. While I have experience managing diabetes alongside my husband (he was diagnosed with Type II ten years ago), we have never had the low blood sugar frights or the midnight or midmorning testings. How vigilant you and your husband are. How careful and attentive. Marvelous, really. I also hope you manage to care for yourselves, too. That’s the place I am in now, realizing that self care, and self awareness of the caregiver is. I had begun to sense that the insulin burned as it injects. I had noticed that John would cringe. You mentioned that as well. It’s hard not to assume some of the (responsibility) for ‘causing’ pain to a loved one, but I am trying not to put on that mantle. Still, it is painful to know that a loved one suffers and there is nothing we can do to take away that immediate pain. No doubt that is why your art work is such a salve, and regeneration, for you and your whole family. A necessity. I admire that you are so diligent with it. You are teaching your children such wonderful things in every moment. How to manage, how to cope, how to LIVE. As to the emotions and how that affects blood sugars. In my husband’s situation, as a Vietnam vet exposed to Agent Orange (making his diabetes almost a different sort of strain in how it responds to anything), his chronic stress, anxiety and nightmares can elevate his sugars to the 200s and 300s despite watching his diet or exercise. Infections, to which he is more susceptible, do the same thing. It’s as if we are at the other end of the spectrum of what you live through. I think your experience is more difficult than mine. All the more reason every time I see your paintings and expressions of joy and hope that I will rejoice alongside you. Many blessings to every single one of you in your family! Jennifer, Best wishes to you and your family. The love and commitment you have towards one another shines through your post. Maddie chose the right parents. You two are so on top of this situation. You have a 24/7 concern and are doing a great job of handling it. Your post really helped the uninformed (like me) to understand the life of diabetics. I am glad you are sharing. I didn’t know just how much is involved in taking care of a loved one with diabetes.